The number of orbital veins is variable; they are maximum three in numbers. 1. Superior ophthalmic vein (SOV), the largest and the most consistent of the three orbital veins, originates near the trochlea below the medial orbital roof, and travels posteriorly and medially to enter the cavernous sinus. The direction of flow in the ophthalmic veins is from extracranial to intracranial. The reversal of flow should raise suspicion of intracranial venous hypertension. The SOV anastomoses with the supraorbital vein and the angular vein. 2. Inferior ophthalmic vein (IOV). is smaller than the SOV, it is connected to the SOV via several anastomotic vessels and also drains into the cavernous sinus or directly drain into the superior ophthalmic vein. 3. Medial ophthalmic vein. May be present. Dilatation of SOV is primarily reported in carotid-cavernous fistula, unilateral as well as bilateral. There are many other causes of unilateral / bilateral SOV dilatation. Any intracranial pathology that causes raised ICT like severe diffuse cerebral odema causes bilateral SOV dilatation. 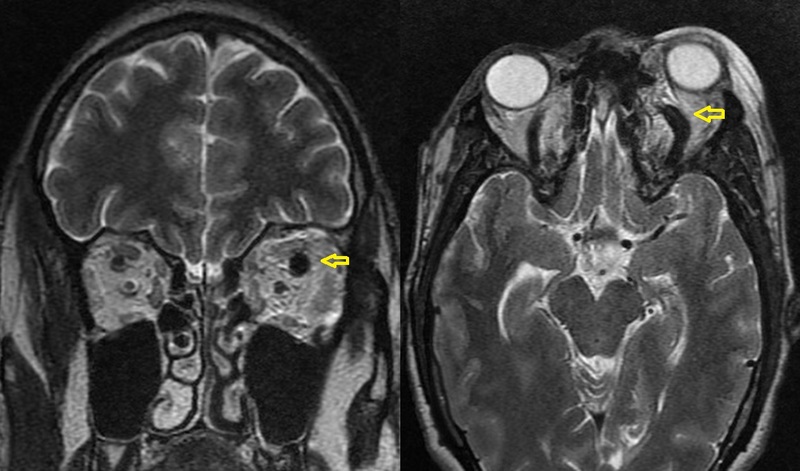 Unilateral causes of SOV dilatation are Ophthalmic Graves disease, Tolosa-Hunt syndrome, inflammation at the apex of the orbit, Oribital Peri orbital Vascular malformation, Orbital pseudo tumor, cavernous sinus tumour or thrombosis, retrocavernous meningiomas etc. Dilatation of SOV can be demonstrated on CT as wel as MR imaging. 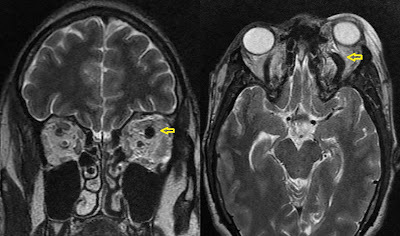 Along with demonstration of dilated SOV, associated findings like extraocular muscle enlargement, intra or peri orbital space occupying lesion, Vascular malformation, Cavernous sinus if any can also be evaluated, which can contribute in etiological diagnosis of enlarged SOV, in a better way than any other investigation. Dilated SOV seen as tubular signal void on thin Axial T2 sections at the roof of bony orbit. On coronal T2 sections seen as a round flow void, cranial to eye ball just under the superior rectus muscle extending towards orbital apex. Diameters of the SOVs, is measured by using coronal MR images sections and were positively correlated with raised CSF pressure. A case of post traumatic Carotico Cavernous Fistula with bilateral orbital proptosis and dilatation of Superior Ophthalmic Veins marked on left side. Diameter of 2.5mm or more considered as abnormal. In studies conducted, SOV diameter determined on the basis of the MR imaging in pts with normal and raised ICT on lumbar punctures was positively correlated with raised ICP. The exact mechanism for the positive correlation between the diameter of the SOV and the ICP is uncertain. It is suggested that an increased ICP impairs the pressure gradient for venous return from the extracranial SOV to the intracranial cavernous sinus. The SOV is valveless and directly connected to the cavernous sinus. Therefore, it is easily influenced by hydrodynamic changes in the intracranial CSF and is consistent with Bernoulli-Poiseuille equation. The diameters are reversed to normal after the reversal of cerebral swelling or raised ICT. Imaging diagnosis of enlarged superior ophthalmic vein; Wei R, Cai J, Ma X, Zhu H, Li Y. Diameter of the Superior Ophthalmic Vein in Relation to Intracranial Pressure; Jiing-Feng Lirng, Jong-Ling Fuh, Zin-An Wu, Shiang-Ru Lu, and Shuu-Jiun Wang. Handbook of Cerebrovascular Disease and Neurointerventional Technique. Mark R. Harrigan, John P. Deveikis and Agnieszka Anna Ardelt.